Can there be anything better than donkey’s noses? Well, I mean, there’s chocolate cake, and sticking your finger in the little tornado thing the water makes when it goes down the plughole, and Dwayne head butts and conversations with the Delicious Nephews and, and … Okay, there are lots of particularly lovely things in the world (and boy, is it important to focus on them with the state of the world) and donkey’s velvet noses are right up there. A couple of weekends ago we packed our bags, climbed into the Silver Unicorn, and headed for the hills, in the direction of McGregor, to hang out at Vrolijkheid Nature Reserve. Cape Nature are wanting to assess the accessibility of their reserves – big up to them! – and get input, so we joined up with some other fabulous people to do just that. It was perfect timing, as a break away from the city was becoming a necessity after a particularly busy three weeks and some serious city claustrophobia making it hard to breathe. Down the rabbit hole we went. 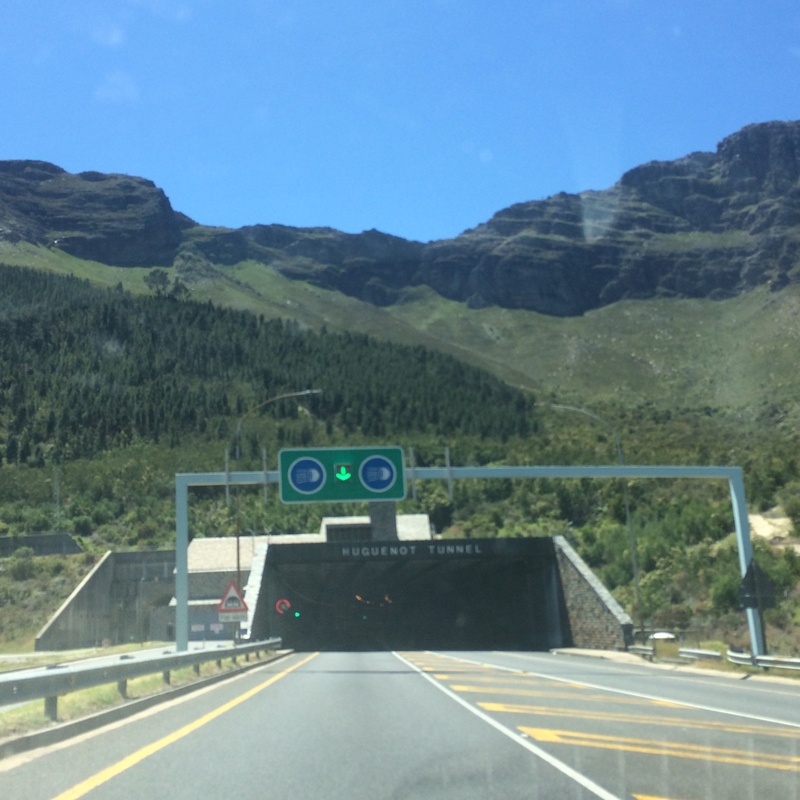 That’s what I call driving through the Huguenot Tunnel, in an attempt to allay my fears while driving through there. I hate going through it, petrified that we’ll get stuck mid-tunnel, in that foul, oppressive air. Perhaps it’s because I’m a geologist’s child, and grew up on the gold mines, where thousands of miners spent hours in the hot dark maze of tunnels seamed with gold, underneath us. I went down once, not very far down. It was not a nice place. People snigger at my fear of getting stuck in that there tunnel but it really happened once to G, when a truck broke down. She was stuck in there for an hour. An HOUR. Eek. Anyway, let me get back to happier things. Things on the other side of the tunnel, where the air is clearer and the sky is bigger. And on toward McGregor after making a quick stop in Robertson for supplies. 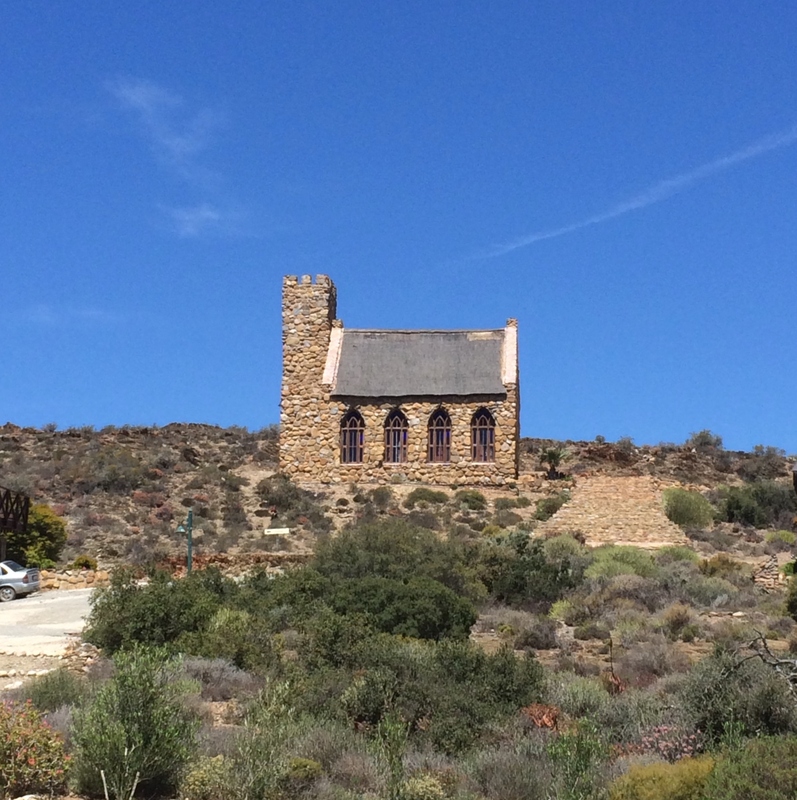 Vrolijkheid is a nature reserve just before you reach McGregor and has five spacious self-catering cottages on the opposite side of the road to the reserve. 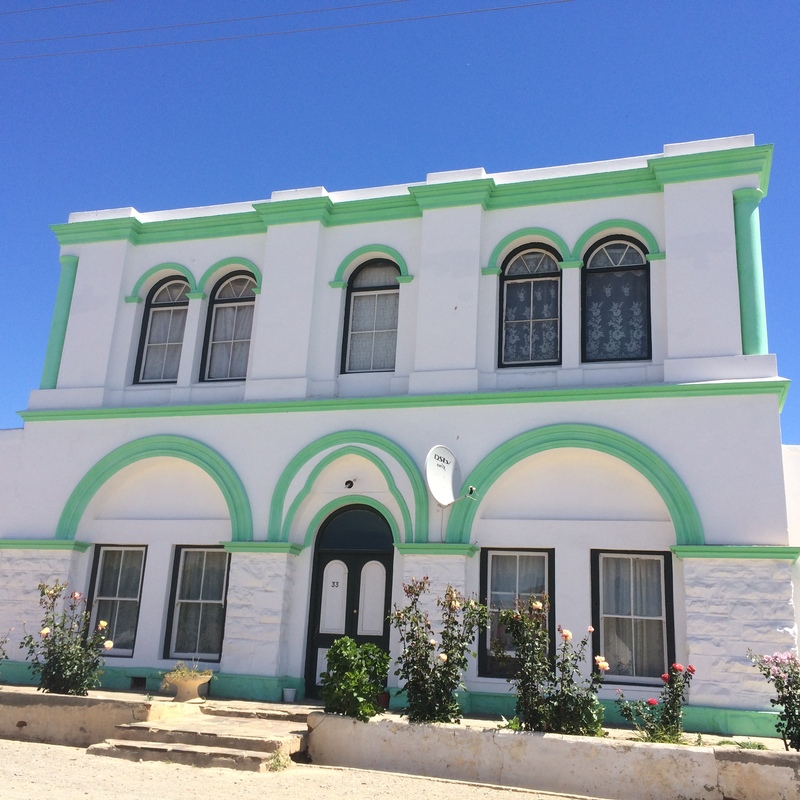 It’s a good place to go if you want to explore McGregor, but not stay in the village. 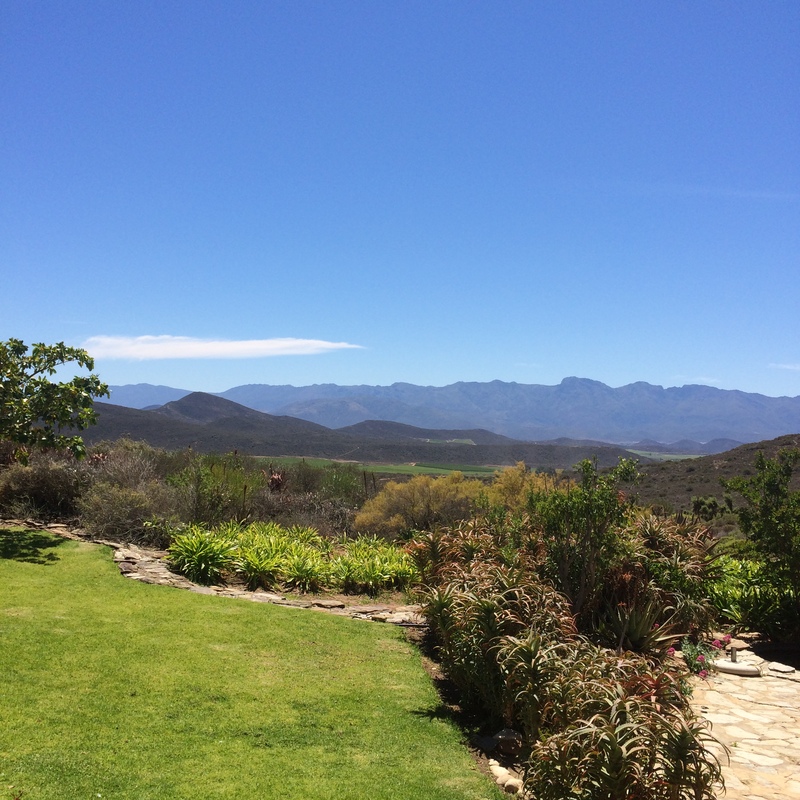 Verandas with views across to the mountains and braai places are a perfect place to sit and just be. 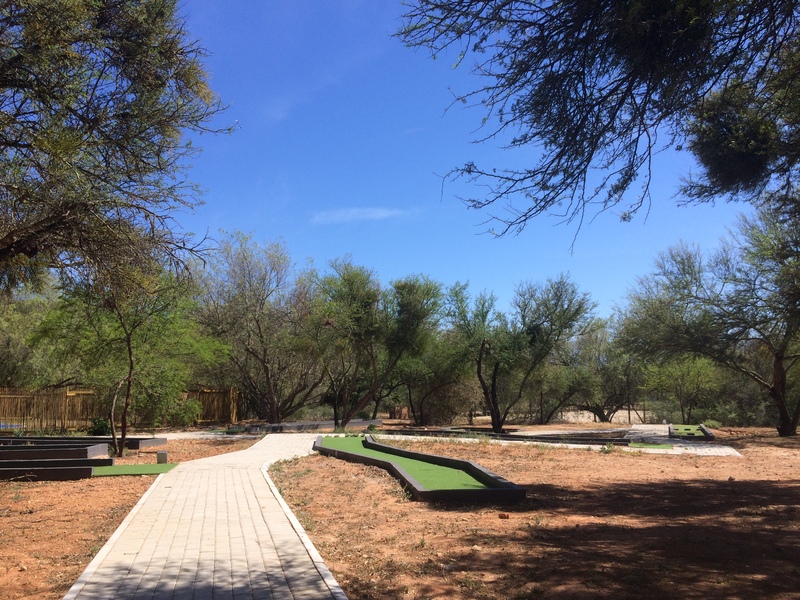 It’s one of those places that’d be great to go with lots of families with kids – clubs and balls for the putt-putt course are in each house and there’s loads of space to run, explore and play. I kind of expected to find a woman teaching people to do the cha cha – a’la Dirty Dancing – on the huge lawn opposite the cottage. I cold almost see the ghost of Patrick Swayze dancing, as we made our way back from a braai with the lovely neighbours on our second night there. There’s nothing better, really, than a weekend away from the city, some exploring of the countryside and good sleeps after days in the fresh air. Add to that, a spectacular lunch at the Lady Grey restaurant at Lord’s Guest Lodge – the place is kind of storybook guesthouse with ducklings, a chapel (when my prince finally asks for directions and rides in on a white horse, this’ll be where I marry) and stone cottages with breath-taking views – and you’ve got a good recipe for a weekend away. McGregor‘s main road is flat and smooth with lots of little shops and restaurants to explore. Some have a step or two, but it’s a small town, people are helpful. There are plenty of pretty buildings to look at and friendly people to chat to and some pretty impressive looking restaurant menus. Next time we’ll have to stay longer to try them all. Vrolijkheid‘s cottages are huge and old school. The one we stayed in was relatively accessible, with a fabulous big bedroom on the ground floor (others have upstairs bedrooms too), but inaccessible bathroom. 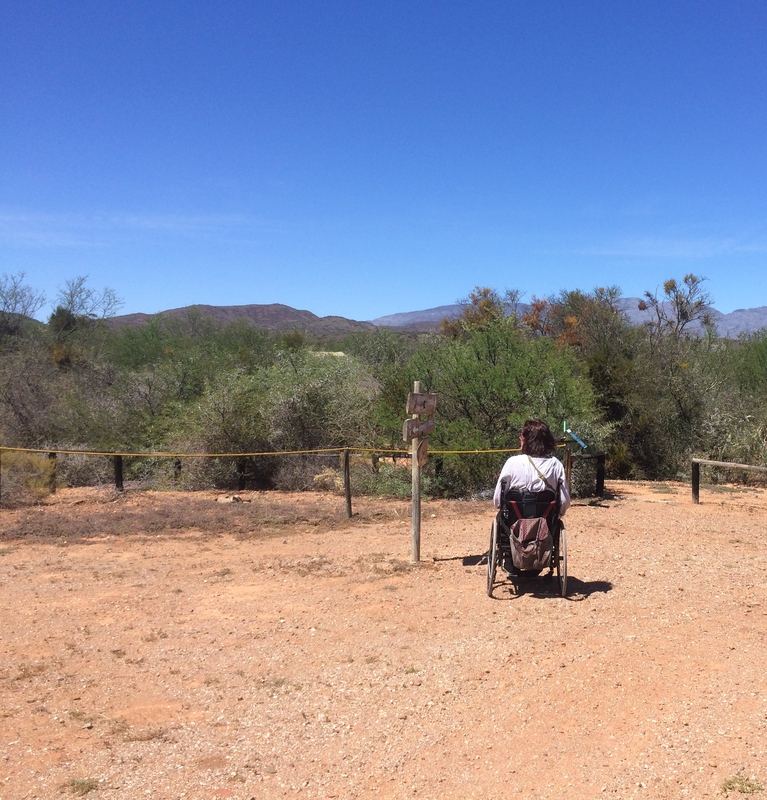 That’s why we were there, though, to give Cape Nature feedback, as they’re wanting to sort out the universal accessibility of all there places, which is amazing! The nature reserve itself offers lots of pretty hikes. We attempted a short one, but had to turn back – too many rocks and stones. On the other side of the dam there is a wonderful, completely accessible bird hide, with wooden walkways leading to it. 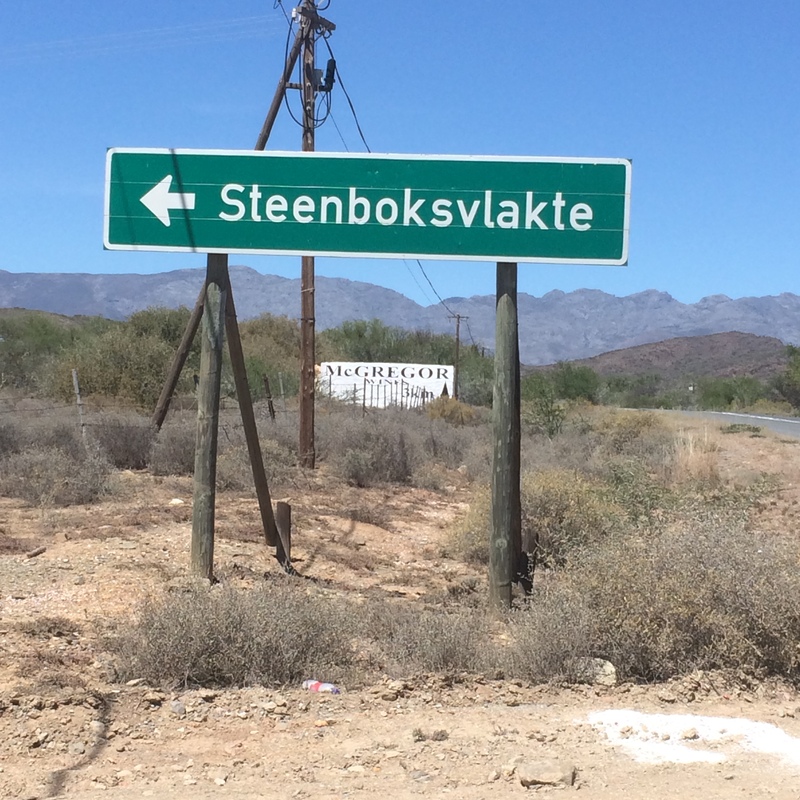 Take the Steenboksvlakte turning to get to it. 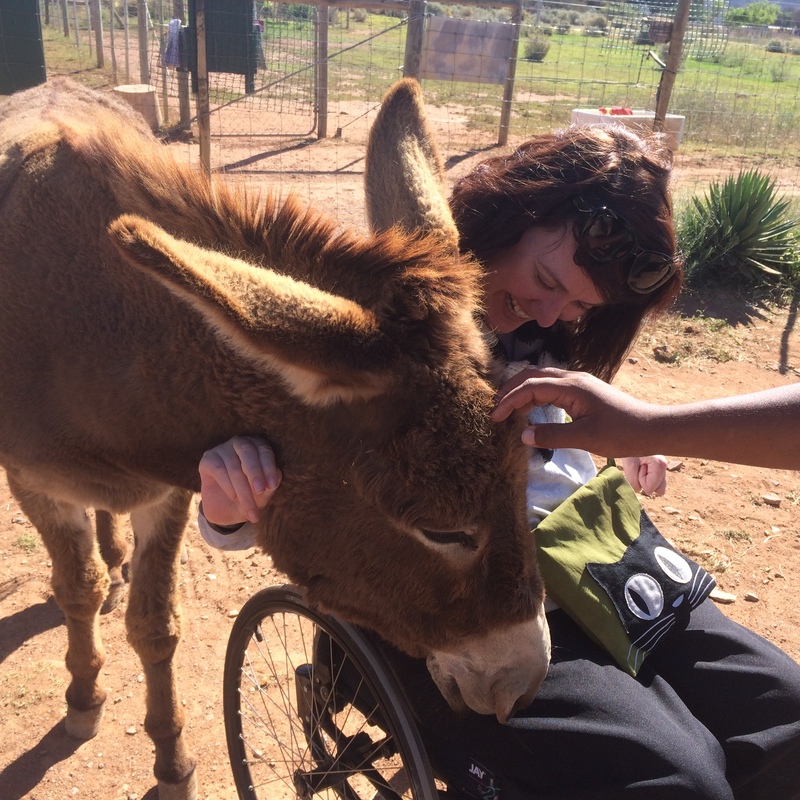 Eseltjiesrus Donkey Sanctuary has ramps to the restaurant, a wheelchair-friendly bathroom and a (fairly steep) ramp down and across a gravel road to the donkey enclosure. Doable, with a little help. Lord’s Guest Lodge apparently has an accessible cottage. We didn’t see it, so I’m not sure of its specifics. The whole place is balanced on a steep slope with dust roads, so I think the lowest cottage, with easy access to the pool, pub and restaurant would be best. The restaurant is accessible (bathroom small, tucked under the stairs, so not accessible, but lovely staff who, I’m sure with some notice, could make a plan). *This blog was first published on my personal blog, Navel-Gazing 101. All words and images are my own.